With more than three decades of experience in solving tough applications problems for its customers, Argonics provides an invaluable advantage for you in your next urethane application. At the MEI show a couple of weeks ago, we offered visitors to our booth a sneak peek at our newest product, currently in testing. 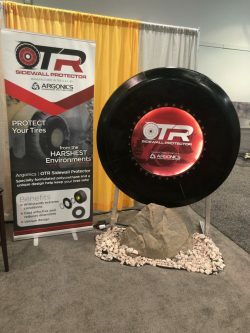 The Argonics OTR Sidewall Protector is being tested at a concrete recycling plant and an aggregate quarry in Canada and will be launched officially at AGG1 in February. Look for more information to be released soon. Buy our snow plow cutting edges now! ©2019 Argonics, Inc. All rights reserved.